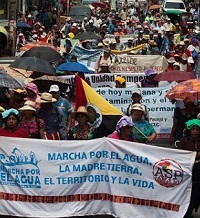 “Water is life” is the message that countless organizations across Guatemala have rallied around as thousands march more than 260 miles to demand that the Guatemalan government act, and protect right to water. 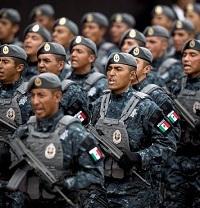 Tens of thousands of protesters set out on the long, and grueling march to Guatemala City on April 11 to demand that the government protect their right to water, and for an end to the privatization of water resources. 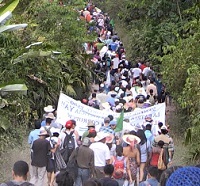 Fifteen hundred people from at least 22 countries convened in Honduras from April 13-15, 2016 for the “Peoples of ¡Berta Vive!” International Gathering. They came to honor slain global movement leader Berta Cáceres and to commit themselves to keeping her legacy alive.